A customer being served at Koorong's flagship West Ryde store. 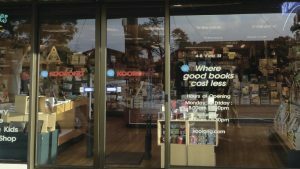 To mark the 40th birthday of Koorong – Australia’s largest retailer of Christian books, music and other materials – Eternity shares three personal stories of changed lives. In late August 2017, I walked into Koorong. My hair was dark, my face in lines of despair. I had soul but not life, broken and lost, so blind that I just couldn’t see. It was the first day in forever I had picked up the Bible and read from it. That was the day I met Nicola, a worker in Koorong, Blackburn, Vic. An avid bookworm, I was asked to go in and pick up a Bible called “The Message” for my partner, who had been in a Christian drug and alcohol rehabilitation centre at Nyora in Victoria called Remar Australia for a month. I was heading in for my first visit and church service that Sunday. Now I don’t know about anyone reading this, but to tell an addicted person whom you are separated from and who you had to turn your back on for their own good and for your own health … that message, it was hard, especially for a non-believer as I was at that time. I didn’t understand how it would be met but I didn’t need to at that point; I was just the person chosen to give the message. And by the love and grace of God, he knew it was time to seek help, and that started what will now be the rest of my walk as a woman of faith as well. My partner – now with God’s blessing over us and the gift of forgiveness, my fiancé – had suffered greatly with drug abuse, namely ice. A very broken man, and now he is 10 months free of all addictions. I had a warped vision of what being a Christian was, almost like drinking from a glass and looking through the bottom into what was a clear prism yet created a thick and distorted view. I walked through the door and a bookstore excites me at the best of times but this had a feeling about it, a blessing. I didn’t have much money, but I knew what I wanted. I don’t even think I knew what to say. I am pretty sure tears prickled in my eyes, and if they didn’t then they certainly started when I got home. It was the most sincere gift and I knew what having a Bible meant: it meant he wanted me to get to know him. I asked if she could write in it and the Scripture chosen is now almost a way of living and resting in him as I await restoration and purpose: “The Lord will fight for you; you need only be still” (Exod 14:14). What Nicola didn’t know at that point was my testimony. My personal story is one of triumph. I was and in some parts still am an abused woman multiple times over – the cycle I never knew how to break and almost felt like that was all I would ever amount to. I had suffered a marriage breakdown in 2012, which I am still recovering from. My two daughters from that marriage and I are experiencing a painful separation of our rights that has so far lasted three years and counting – maternal alienation and a form of domestic abuse by proxy. My home had been burned down by arson in 2015 and I lost all material possessions. I had suffered many mental breakdowns and been in and out of hospitals for mental health and on so many different medications. I found it hard to leave the house and sat on the couch for a year, barely even living. Don’t get me wrong: I pretended I was happy but inside I was in the type of pain that only those that have been in the dark can comprehend. I was broken. That was the first day I prayed over my Bible and was led to Psalm 18. That whole passage has fed my hope in such a powerful way. Thank you Jesus. Going forward, that day changed my life; I am now the most gracious fruit bearer of a sound mind in God’s loving grace: I quit smoking, I don’t drink alcohol any more and stopped cursing. My heart has been transformed. I have accepted Jesus into my life; my partner asked me to marry him on Christmas Eve; I was baptised in the ocean at San Remo on the 6 February 2018; I have beared witness to others coming to Christ; he is restoring my family; I have been able to gift Bibles and pay it forward. Praise God for giving me vision when the darkness blinded me. 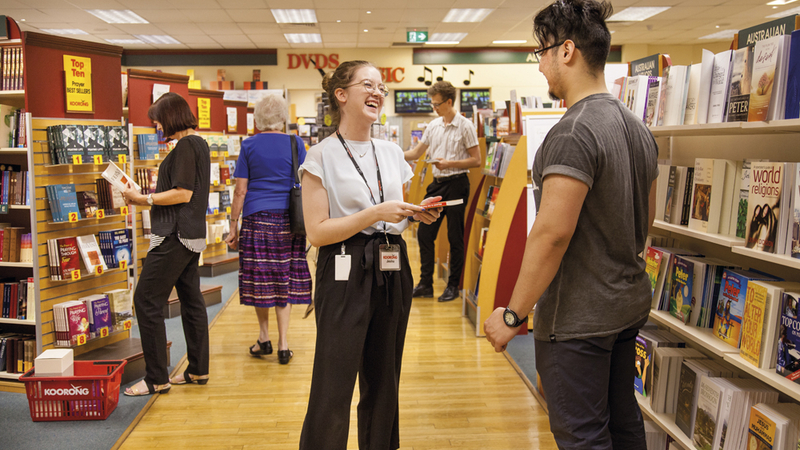 God’s presence is shown very clearly in the lives of two customers from our Adelaide store. The story goes like this: One day a customer came into our store, searching for a suitable Bible which she wanted to buy for her mother to read. After belonging to the Muslim faith for most of her life, this customer had just become a Christian herself. She said that her mother had recently shown an interest in the Christian faith and had asked for a Bible to compare with the Koran. Her mum was a woman who appreciated the finer things of life and therefore she wanted to buy the best one she could find, and she didn’t care how much it cost – she just wanted her mother to be encouraged to read it. After much discussion, she chose a leather-bound NIV Bible which was quite expensive. I prayed over the Bible asking for God’s blessing over the choice of the Bible, and that, as her mother read it, God would speak to her heart. The very next day, an extremely excited daughter returned to the store praising God. Her mother had sat down and immediately read about the good news of our Lord and Saviour – a wonderful miracle had occurred at 3am that night, as God revealed himself to her mother. A few days later, the mother came into the store to purchase some Christian books. Being accustomed to the Muslim faith, she was an avid reader. At that time, by the way she spoke, one would have thought that she had been a Christian all her life. Soooo … she went back home with over $800 of Christian books to read! And this is only one of many amazing stories from my 20 years working in the Adelaide Store. My first day as the manager of the Blackburn store in Melbourne was one I will never forget. I had a request to come to the front counter as a customer wanted to see me. The customer had a huge amount of stock that, from a distance, I suspected he wanted to return. My assumption was correct but not for the right reason. I don’t know if I could call him a customer; he was, in fact, a thief. See, he had stolen $400 worth of stock and the Holy Spirit had convicted him to return the CDs, videos (yes, videos! ), books and Bibles, as he had given his life to Jesus. He admitted the stock was stolen and expected the police would need to be involved. I showed grace as I had been shown grace and forgiveness from Jesus for my sins, and did not involve the police. He then became a regular paying customer and the Holy Spirit turned his life around.